Are You Sensitive, Creative and Empathic, and Feel Out of Place In a World That Seems Utterly Absurd? Then this 2016 Readers’ Favorite Book Award Finalist is for you! Awaken to your true nature by recognizing the divine differences that make you receptive, sensitive and empathic. Break free from codependency with insights and practical tools to become emotionally free. Discover your true purpose to balance the Feminine and Masculine and contribute your unique gifts to promote a new cosmic cycle of light. 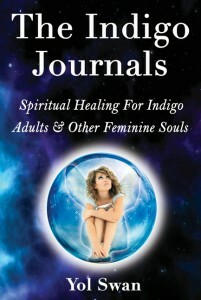 If you’ve ever wondered what your purpose is and why you feel disempowered and disconnected in a world that doesn’t make sense to you, The Indigo Journals holds the answers you’ve been looking for! From her mystical experiences, channeled messages and encounters with enlightened masters, to the cosmic memories that led her to an in-depth exploration of the wounded Feminine, the author takes you on a spiritual healing journey of self-discovery to unlock your hidden creative power and fulfill your purpose in this overly masculine world. A 2016 International Readers’ Favorite Book Award Finalist! “Authentic, personal, revealing, courageous! ‘Being Indigo’ has not been said in this way before – groundbreaking! This book takes the understanding of the Indigo Soul to a whole different level. As the student becomes the master, Yol Swan brings forth a virtual cornucopia of insights and understandings of what being an Indigo feels like and how to channel our extraordinary gifts.” JANINE TALTY, author of Indigo Awakening: A Doctor’s Memoir of Forging an Authentic Life in a Turbulent World. “Yol Swan is quite simply a healing transmitter of knowledge and wisdom of the Indigo soul. She combines astonishing and wide-ranging healing insights with a profound and exquisite heart presence upon every page. In my experience with writing and the ability to ‘transmit’ —she has it. She is a gift to the world.” ANAIYA SOPHIA, author of Womb Wisdom: Awakening the Creative and Forgotten Powers of the Feminine. On top of the many spiritual tools provided in the book, you will also get BONUS LINKS to a Feminine Self-Assessment Questionnaire, a Guided Meditation for Vitality and a Past Life Regression. Are you ready to transform your life… and the world?